There are about 445 living Indo-European languages, according to the estimate by Ethnologue, with over two thirds (313) of them belonging to the Indo-Iranian branch. The Indo-European languages with the greatest numbers of native speakers are Spanish, English, Hindustani (Hindi-Urdu), Portuguese, Bengali, Punjabi, and Russian, each with over 100 million speakers, with German, French, Marathi, Italian, and Persian also having more than 50 million. Today, nearly 42% of the human population (3.2 billion) speaks an Indo-European language as a first language, by far the highest of any language family. 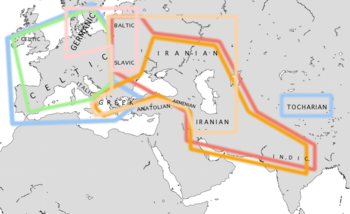 In the 16th century, European visitors to the Indian subcontinent began to notice similarities among Indo-Aryan, Iranian, and European languages. In 1583, English Jesuit missionary and Konkani scholar Thomas Stephens wrote a letter from Goa to his brother (not published until the 20th century)  in which he noted similarities between Indian languages and Greek and Latin. In 1647, Dutch linguist and scholar Marcus Zuerius van Boxhorn noted the similarity among certain Asian and European languages and theorized that they were derived from a primitive common language which he called Scythian. He included in his hypothesis Dutch, Albanian, Greek, Latin, Persian, and German, later adding Slavic, Celtic, and Baltic languages. However, Van Boxhorn's suggestions did not become widely known and did not stimulate further research. Thomas Young first used the term Indo-European in 1813, deriving from the geographical extremes of the language family: from Western Europe to North India. A synonym is Indo-Germanic (Idg. or IdG. ), specifying the family's southeasternmost and northwesternmost branches. This first appeared in French (indo-germanique) in 1810 in the work of Conrad Malte-Brun; in most languages this term is now dated or less common than Indo-European, although in German indogermanisch remains the standard scientific term. A number of other synonymous terms have also been used. Balto-Slavic, believed by most Indo-Europeanists  to form a phylogenetic unit, while a minority ascribes similarities to prolonged language-contact. Slavic (from Proto-Slavic), attested from the 9th century AD ( possibly earlier), earliest texts in Old Church Slavonic. Slavic languages include Bulgarian, Russian, Polish, Czech, Slovak, Montenegrin, Macedonian, Bosnian, Croatian, Serbian, Slovenian, Ukrainian, Belarusian, and Rusyn. Hellenic and Greek (from Proto-Greek, see also History of Greek); fragmentary records in Mycenaean Greek from between 1450 and 1350 BC have been found. Homeric texts date to the 8th century BC. Indo-Aryan (including Dardic), attested from around 1400 BC in Hittite texts from Asia Minor, showing traces of Indo-Aryan words. Epigraphically from the 3rd century BC in the form of Prakrit ( Edicts of Ashoka). The Rigveda is assumed to preserve intact records via oral tradition dating from about the mid- second millennium BC in the form of Vedic Sanskrit. Includes a wide range of modern languages from Northern India, Southern Pakistan and Bangladesh including Hindustani, Bengali, Assamese, Punjabi, Kashmiri, Gujarati, Marathi, Odia and Nepali as well as Sinhala of Sri Lanka. Tocharian, with proposed links to the Afanasevo culture of Southern Siberia. Extant in two dialects (Turfanian and Kuchean, or Tocharian A and B), attested from roughly the 6th to the 9th century AD. Marginalized by the Old Turkic Uyghur Khaganate and probably extinct by the 10th century. PIE was an inflected language, in which the grammatical relationships between words were signaled through inflectional morphemes (usually endings). The roots of PIE are basic morphemes carrying a lexical meaning. By addition of suffixes, they form stems, and by addition of endings, these form grammatically inflected words ( nouns or verbs). The reconstructed Indo-European verb system is complex and, like the noun, exhibits a system of ablaut. 1500–1000 BC: The Nordic Bronze Age develops pre-Proto-Germanic, and the (pre)- Proto-Celtic Urnfield and Hallstatt cultures emerge in Central Europe, introducing the Iron Age. Migration of the Proto- Italic speakers into the Italian peninsula ( Bagnolo stele). Redaction of the Rigveda and rise of the Vedic civilization in the Punjab. The Mycenaean civilization gives way to the Greek Dark Ages. Hittite goes extinct. 1000–500 BC: The Celtic languages spread over Central and Western Europe. Baltic languages are spoken in a huge area from present-day Poland to the Ural Mountains. Proto Germanic. Homer and the beginning of Classical Antiquity. The Vedic Civilization gives way to the Mahajanapadas. Siddhartha Gautama preaches Buddhism. Zoroaster composes the Gathas, rise of the Achaemenid Empire, replacing the Elamites and Babylonia. Separation of Proto-Italic into Osco-Umbrian and Latin-Faliscan. Genesis of the Greek and Old Italic alphabets. A variety of Paleo-Balkan languages are spoken in Southern Europe. 500 BC–1 BC/AD: Classical Antiquity: spread of Greek and Latin throughout the Mediterranean and, during the Hellenistic period ( Indo-Greeks), to Central Asia and the Hindukush. Kushan Empire, Mauryan Empire. Proto-Germanic. 500–1000: Early Middle Ages. The Viking Age forms an Old Norse koine spanning Scandinavia, the British Isles and Iceland. The Islamic conquest and the Turkic expansion results in the Arabization and Turkification of significant areas where Indo-European languages were spoken. Tocharian is extinct in the course of the Turkic expansion while Northeastern Iranian ( Scytho-Sarmatian) is reduced to small refugia. Slavic languages spread over wide areas in central, eastern and southeastern Europe, largely replacing Romance in the Balkans (with the exception of Romanian) and whatever was left of the paleo-Balkan languages with the exception of Albanian. 1500–2000: Early Modern period to present: Colonialism results in the spread of Indo-European languages to every continent, most notably Romance (North, Central and South America, North and Sub-Saharan Africa, West Asia), West Germanic ( English in North America, Sub-Saharan Africa, East Asia and Australia; to a lesser extent Dutch and German), and Russian to Central Asia and North Asia. Vedic Sanskrit (c. 1500–500 BC). This language is unique in that its source documents were all composed orally, and were passed down through oral tradition ( shakha schools) for c. 2,000 years before ever being written down. The oldest documents are all in poetic form; oldest and most important of all is the Rigveda (c. 1500 BC). PIE is normally reconstructed with a complex system of 15 stop consonants, including an unusual three-way phonation ( voicing) distinction between voiceless, voiced and " voiced aspirated" (i.e. breathy voiced) stops, and a three-way distinction among velar consonants (k-type sounds) between "palatal" ḱ ǵ ǵh, "plain velar" k g gh and labiovelar kʷ gʷ gʷh. (The correctness of the terms palatal and plain velar is disputed; see Proto-Indo-European phonology.) All daughter languages have reduced the number of distinctions among these sounds, often in divergent ways. The "central" satem languages ( Indo-Iranian, Balto-Slavic, Albanian, and Armenian) reflect both "plain velar" and labiovelar stops as plain velars, often with secondary palatalization before a front vowel (e i ē ī). The "palatal" stops are palatalized and often appear as sibilants (usually but not always distinct from the secondarily palatalized stops). The "peripheral" centum languages ( Germanic, Italic, Celtic, Greek, Anatolian and Tocharian) reflect both "palatal" and "plain velar" stops as plain velars, while the labiovelars continue unchanged, often with later reduction into plain labial or velar consonants. `-C- Following an unstressed vowel ( Verner's law). C(u) Before or after a (PIE) u ( boukólos rule). C(O) Before or after a (PIE) o, u ( boukólos rule). Cruki− After r, u, k, i ( Ruki sound law). C..Ch Before an aspirated consonant in the next syllable ( Grassmann's law, also known as dissimilation of aspirates). CE..Ch Before a (PIE) front vowel (i, e) as well as before an aspirated consonant in the next syllable ( Grassmann's law, also known as dissimilation of aspirates). C(u)..Ch Before or after a (PIE) u as well as before an aspirated consonant in the next syllable ( Grassmann's law, also known as dissimilation of aspirates). 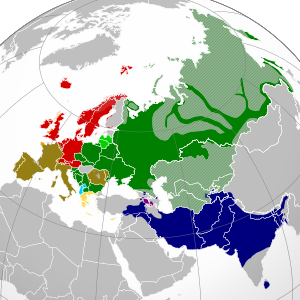 Today, Indo-European languages are spoken by almost 3 billion native speakers across all inhabited continents,  the largest number by far for any recognised language family. Of the 20 languages with the largest numbers of native speakers according to Ethnologue, 10 are Indo-European: Spanish, English, Hindustani, Portuguese, Bengali, Russian, Punjabi, German, French and Marathi, accounting for over 1.7 billion native speakers. Additionally, hundreds of millions of persons worldwide study Indo-European languages as secondary or tertiary languages, including in cultures which have completely different language families and historical backgrounds—there between 600 million  and one billion  L2 learners of English alone. ^ Mallory, J. P. (2006). The Oxford Introduction to Proto-Indo-European and the Proto-Indo-European World. Oxford: Oxford University Press. p. 442. ISBN ISBN 9780 199287918 Check |isbn= value: invalid character ( help). ^ Nakhleh, Luay; Ringe, Don & Warnow, Tandy (2005). "Perfect Phylogenetic Networks: A New Methodology for Reconstructing the Evolutionary History of Natural Languages" (PDF). Language. 81 (2): 382–420. CiteSeerX 10.1.1.65.1791. doi: 10.1353/lan.2005.0078. ^ Greppin, James (1996). "Review of The linguistic relationship between Armenian and Greek by James Clackson". Language. 72 (4): 804–07. doi: 10.2307/416105. JSTOR 416105. ^ Lubotsky, A. (1988). "The Old Phrygian Areyastis-inscription" (PDF). Kadmos. 27: 9–26. doi: 10.1515/kadmos-1988-0103. Lubotsky, A. (1988). "The Old Phrygian Areyastis-inscription" (PDF). Kadmos. 27: 9–26. doi: 10.1515/kadmos-1988-0103.